How can I get my students to become better writers? How can I get my students to experience what good writing is without authoritatively defining what good writing needs to be? How can I jumpstart my student’s learning in a way that makes them more reflective, creative, inquisitive, open-minded, tenacious, flexible, and collaborative? I see many of these answers to these questions appear in blogging. The grand experiment in my 10th and 11th grades this year is to have my students blogging about many various things: experiences, opinions, creative writing, their artist statement, lists. I have found that Edublogs is very helpful in setting up more the technical aspects of blogging. 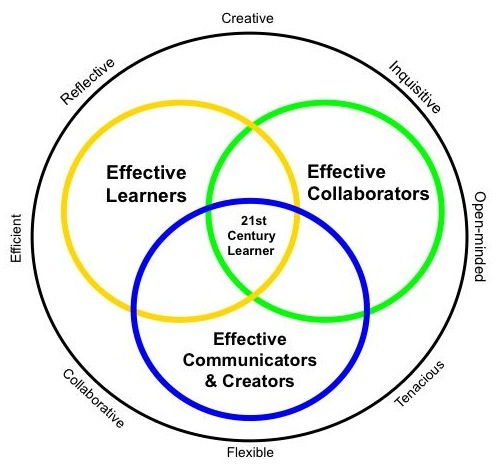 Of course, teaching blogs is more than coaching the technical side of a 21st century learner; a good educator-coach also focuses on the adaptive side of learning. The content of their blogs is endless. They are the content. I am discovering the more I blog, the more inquisitive, open-minded, tenacious, and efficient I am. I feel creative. I feel stronger in my writing because I am publishing something worth paying attention to. I am linking up and generating content for others to explore their own ideas. I have come across the “curriculum” called Currere. It encourages students to make their learning an autobiographical account (Side-note… today some of them were having trouble “taking the fork in the road” when they came to it, and so they have stalled in their writing. I have granted them an extension of their first blog till Friday. It is lunch time — 45 minutes of their own time — and they have remained in class, working on their blog). What does this mean? How should I interpret this moment? My strategies today for getting them to think about drafting their blogs appeared in a 30-minute discussion. We talked about various aspects for beginning the beginning of your blog. How do you filter out so much information when given the freedom to write about anything. I talked about the issue of “Executive Functioning” even with High School students, and my colleague helped me put the issue into a more concrete situation. “Backwards Choosing,” she said. It’s a strategy I will employ with students, as needed. It means choose just five things you might want to write about. Now, narrow it down to four based on the one issue you would least like to write about right now. Keep choosing backwards until you’ve narrowed your topic; now sit down and write. What habits in writing formal papers will these students form from keeping their blog? How does blogging help them learn synthesis and analysis and critical thinking? How does blogging help them gain the skills of the Common Core? This I believe. The content they create will the food for applying the skills. From their content, we will explore modifications and modalities on a theme, explanation of an idea through examples and statistics, designing of a research report, choosing a persuasive appeal, describing and setting up a scene. Writing and Reading are ensembles; the blog is the arena.